"I need electricity in my shed too!" No need to worry! 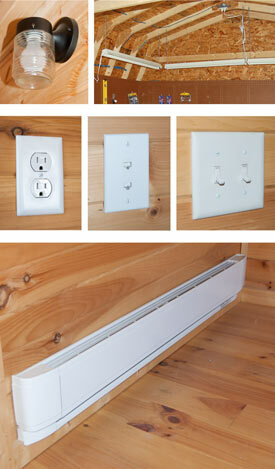 We can set up your shed to be hooked up for electricity after delivery. This is ideal for workshops, offices, and cabins. Don't hassle with running extension cords to your new structure from your home. Whether it be few receptacles or the full works, we run all the wiring for you. An Electrical Inspection Certificate may be required. Electrical packages available with varying breaker boxes.